Here's a fun pattern to create colorful hair accessories. Select yarn colors to match your favorite outfits, add beads or not. Package of rubber-centered hair bands. 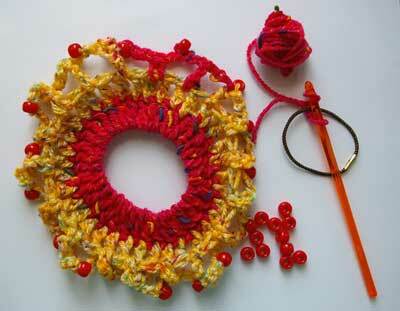 NOTE: To make the Crocheted Hair Band, you will be crocheting around the rubber-centered hair band. To begin, make a slip knot. Bring the slip knot under the hair band, insert hook over the band and yarn over. Pull yarn through the loop on the hook to make a chain stitch. This will secure the yarn around the hair band. Make 2 more chain stitches and proceed to Round 1. Rnd 1: Using the hair band as the center ring, dc until the ring is completely covered without overlapping stitches, join with sl st.
Rnd 2: Ch 3, 1 dc in each st to the beginning ch-3, join with sl st. End yarn. IF YOU PLAN TO USE BEADS: For beading, thread beads onto yarn before Rnd 1. Work Rnds 1 & 2 without using beads. Do not end yarn. Rnd 3: *Ch 3, pull bead to hook, ch 3, skip next dc, dc 1 in following st, * repeat between ** until round is completed. Join to beginning st. End yarn.